Sir Eugene Goossens (1893-1962), Conductor and composer. Sitter in 7 portraits. Paule Vézelay (Marjorie Watson-Williams) (1892-1984), Artist. Artist of 5 portraits, Sitter in 1 portrait. 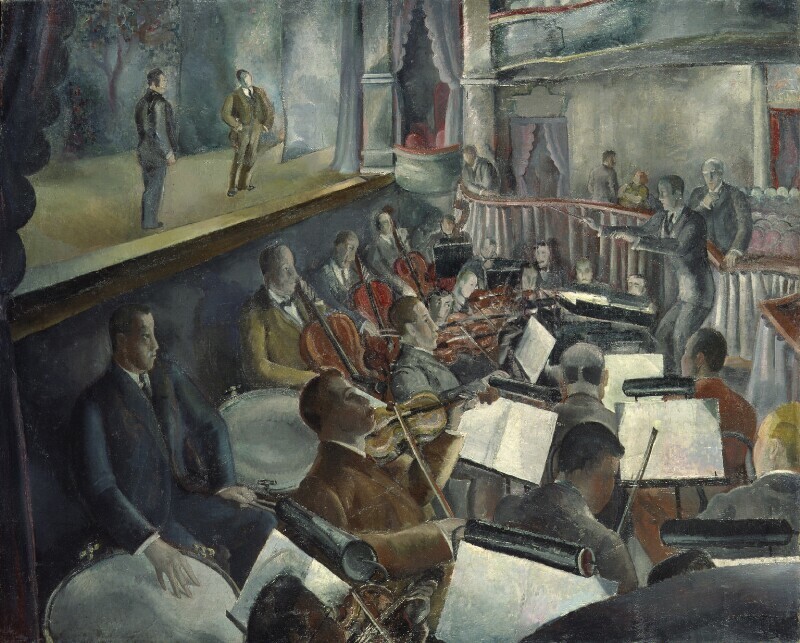 Goosens, the English conductor and composer is here depicted standing on a rostrum rehearsing the Austrian-born tenor Richard Tauber (on stage, left) at the Prince's Theatre, Bristol. No record survives of this event and the theatre was destroyed by bombing during the Second World War. The portrait may commemorate a very early meeting of the two men.Tauber did not move to England until 1938 (he was naturalized in 1940) and Goosens was at this time conductor of the Rochester Philharmonic Orchestra from New York. On the advice of the Governor of the Bank of England, Montagu Norman, Winston Churchill returns British currency to the Gold Standard. This caused deflation across the empire as the value of the pound returned to the pre-war gold price, leading to unemployment, the miners' strike and the general strike in 1926. John Logie Baird transmits the first television images of a ventriloquist's dummy. The BBC used Logie Baird's invention from 1927 until 1935 when they adopted EMI-Marconi's superior electronic scanning system. Virginia Woolf publishes her innovative 'stream of consciousness' novel, Mrs Dalloway, which chronicles a day in the life of the protagonist through her interior monologue. Sir Joseph Austen Chamberlain, Secretary of State for Foreign Affairs represents Britain at the Locarno Treaties. Lorcano secured the post-war territorial settlement and established pledges of non-aggression between various European Nations. The 'spirit of Locarno' helped secure Germany's admission into the League of Nations in 1926. Chamberlain was awarded the Nobel Peace Prize for his part in the peace agreement.